Here are some sketches I did last week in and around the small town of Viken in southern Sweden. Most all of the paintings were done on a heavy watercolor paper that I first sized with rabbit skin glue and then applied a couple layers of oil ground. The paper has a canvas like texture which I find nice for sketching. Growing up on the California coast, we would never have snow, let alone have snow in April! The one big drawback is the paper will need to be mounted on an acid free board before framing. Other than that I think it's a great light weight sketching support. 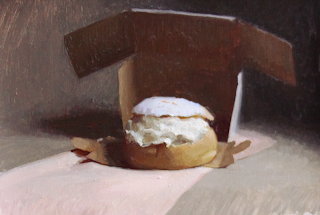 I will be exhibiting two new still life paintings at Kullasalongen this month. If you are in the area feel free to drop by and see all of the great work!